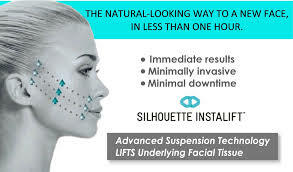 Instalift® is the latest innovation for improving the look of aging. Tiny invisible threads lift the skin from underneath. The threads dissolve over time but the improvement is long lasting. You get a partial lift-up in about 40 minutes. Best of all, there are no bandages, no recovery, no downtime. An instant mini face or next lift! Love Dr. Sackman, I have been seeing him for over 3 years and always leave feeling happy! I highly recommend him! !